I’m very proud of the people working in our office and the service we’ve been able to provide to our community. Our knowledge and personal attention to tax and accounting matters save individuals and businesses time and money. Paying special attention to your bottom line is Mrs. DeTroia’s specialty. Having over 30 years experience, she recognizes that meeting with our business clients on a regular basis in order to analyze costs and save tax dollars is the key to turning our firm’s skills into profitability. A staff member since June 2004, Laura has proven to be a meticulous accountant. Her research skills, data coordination and ability to finish tasks assist in our overall outreach to clients. Sandra has been employed since January 2003. 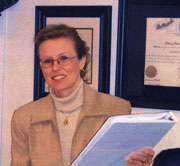 Her experience in preparing tax returns has become an asset to the company. Sandra completes most bookkeeping tasks at the office cost effectively and efficiently. A community icon, business owner and everyone’s favorite. Laurie will not stop until she knows you have exactly what you need.